Looks pretty, doesn't it? 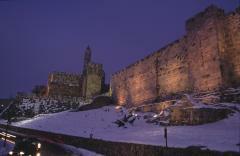 You have never gazed upon true beauty until you've witnessed the holy city of Jerusalem all glittery in the snow. The mix of golden architecture mixed with the white snowy gloss is truly breathtaking and as long as you are able to kick back and admire from the comfort of your apartment/hotel/dorm window all is perfect... perfect, that is, until you have to go somewhere! Our intrepid powder ski team wannabes have a serious decision to make each winter. Will we brave the windswept passes of the Coquihalla highway to get to the B.C. Interior? Or will we play roulette with the Kelowna airport snow and fog closures? Either way it means traveling a day in advance, or risking forfeit of a prepaid powder resort booking. Not to mention the joys of face shots, days of puking snow, and dodging trees and cliffs. All good fun. One of my favorite business trips is San Francisco to Los Angeles. After all it's only one hour in the air! Oooops, I forgot about the six hours on the ground. Let's not bore you with the usual horror stories of traffic, missed taxis and car pileups on the freeway. Today's rant is strictly educational. It's all about tips, tricks, and techniques for handling the infamous airport lineup. What is the difference between www.CarRentalExpress.com (CRX) and the Rest of the car rental sites ...? Mainly, it's the car rental agencies. CRX inventory is the independent agencies. At Car Rental Express, all vehicle suppliers are Renter Rated. Each and every agency receives reviews from you, the renter. Real reviews by real renters create the confidence you need to select an independent car rental agency. A rental agency's website is the online representation of their company – it is where renters get the first impression of what the company has to offer. Renters want to know their expectations will be met and that they can trust their rental experience will be a good one. Without a doubt, if the website is clean, precise and easy to follow, renters are given the confidence they need to complete an online rental and will come back again and again in the future. What is the Revolution™ Reservation System? Revolution™ was built in-house over a period of 10 years and is tailored to fit the needs of Car Rental Express. At the heart of Revolution™ there is a robust rate engine. In a matter of seconds, the rate engine can locate vehicles, dates, daily rates, insurance fees and taxes. It finds everything needed to make up the total charges for a car rental, ensuring there are no surprises down the road. Our company, now known as Express Internet Technologies, has gone through a long journey from its initial conception back in 1999. Through innovation and expansion in development, marketing, technical services, and the creation of a first-rate reservation system, Express ITech has set the bar for the online vehicle rental industry.